So, what do you think of your husband’s brutal crackdown, Mrs Assad? Vogue magazine famously called her a “rose in the desert”, while Paris Match proclaimed she was the “element of light in a country full of shadow zones”. But when Syria’s glamorous First Lady invited a group of aid workers to discuss the security situation with her last month, she appeared to have lost her gloss. During the meeting, British-born Asma al-Assad – who grew up in Acton and attended a Church of England school in west London – came face to face with aid workers who had witnessed at first hand the brutality of her husband’s regime. Yet according to one volunteer who was present, the former investment banker and mother of President Bashar al-Assad’s three children appeared utterly unmoved when she heard about the plight of protesters. Syrians working with aid agencies to try to help the thousands injured as Mr Assad’s security forces unleash tanks, guns and airpower to crush a seven-month uprising against his rule had hoped for a lot more. The First Lady’s office contacted them and said she wanted to hear about the difficulties they faced in the field. She met the humanitarians in Damascus. “She asked us about the risks of working under the current conditions,” he added. But when she was told about the abuses of power being committed by her husband’s notorious secret police, Mrs Assad’s blank face left them unimpressed. “She sees everything happening here. Everything is all over the news. It’s impossible she doesn’t know,” said the volunteer. Yet even if Mrs Assad does know about the worst of the violence and the 3,000 civilians human rights groups accuse the regime of killing, many people who have met her question what she could possibly do about it. Mrs Assad, who achieved a first class degree in computer science from King’s College University, was brought up in Britain by her Syrian-born parents, who were close friends of Hafez al-Assad, the former President of Syria. She started dating Bashar al-Assad in her twenties, and they eventually married in 2000, when she moved to Syria for the first time. She championed several development initiatives, and delivered genuine change by helping to create NGOs in Syria, as well as highlighting the plight of disabled children and laying the groundwork for plans to rehabilitate dozens of Syria’s ramshackle museums. For some, she is the modern, made-up face of a former pariah state; to others, an aloof, 21st-century Marie Antoinette. Either way, nothing perhaps crystallised the fate of Syria’s First Lady better than the disastrously-timed interview run by Vogue magazine in its March issue this year. Naturally, many outraged Syrians were left asking why the Assads could not extend them the same courtesy. Fears are mounting that Syria may be on the verge of civil war as reports emerged yesterday that hundreds of army deserters were battling Bashar al-Assad’s forces in the first major confrontation against the regime. With an intensification of violence looking increasingly likely, Britain and its EU allies have been forced to drop calls for immediate UN sanctions against Syria after major powers failed to agree upon a suitable course of action. The UK, along with France, Germany and Portugal, circulated a heavily-diluted draft Security Council resolution condemning the Baathist regime in Damascus. But calls for immediate sanctions were scrapped in the face of Russian and Chinese opposition. Delegates hoped that the weaker document, which demanded an “immediate end to all violence”, would eventually be approved by the two veto-wielding members. A series of European and US-sponsored sanctions against the Syrian regime are already in place, but no measures have yet been approved at the UN. The developments in New York came as heavy fighting continued in the central Syrian town of Al-Rastan, an opposition stronghold which has become a bolthole for army deserters. Activists said that at least 1,000 former soldiers and armed citizens were now waging a battle against security forces, who were laying siege to the town backed up by tanks and helicopter gunships. According to New York-based human rights organisation Avaaz, the Syrian regime was even deploying jets to bomb the town of 40,000 people, a claim that was repeated by at least two activist organisations monitoring the violence. Elsewhere in the town, there were reports of tanks shelling homes, helicopters strafing neighbourhoods with heavy machine guns, and electricity and water supplies being severed. Nadim Houry, senior researcher for Human Rights Watch in Beirut, said he had heard reports of jets over Al-Rastan but had received no information about bombs being dropped. If the claim is true, it would mark a serious escalation of the violence. It will also heighten concerns that Syria is slipping into a Lebanese-style conflict that could seriously destabilise the region. Radwan Ziadeh, a Syrian exile and prominent opposition voice, said the fighting in Al-Rastan highlighted the need for firmer international action. “This is why we need a no-fly zone,” he said, adding that such a measure would provide a much-needed safe haven for defecting troops. Although Syria’s protest movement has been largely peaceful since unrest erupted in March, recently there have been numerous reports of mutinous troops cobbling themselves together into rebel groups. The area around Homs, the central Syrian city about 10 miles south of Al-Rastan, has seen the greatest number of desertions. Some of the bloodiest crackdowns on protesters have happened in the region. 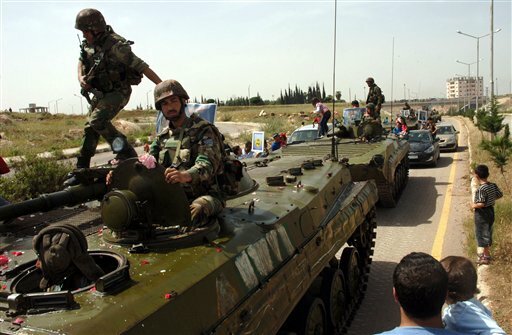 The battle in Al-Rastan is the first major confrontation between deserters and the regime, though the majority of troops still remain loyal to the army. Even so, activists have told The Independent that some protesters, in the face of brutal state-sponsored violence, are now looking to arm themselves. “People are looking for contacts and finance,” said one, who asked not to be named. Yesterday’s continuing violence came as Human Rights Watch called for a UN investigation into the decapitation of an 18-year-old Syrian woman. Zainab al-Hosni, from Homs, was tortured and beheaded before her body was returned to her family. A nuclear engineer was also shot dead in Homs yesterday, according to Syria’s state news agency. Officials blamed “armed terrorists”, but activists said the regime was targeting academics.